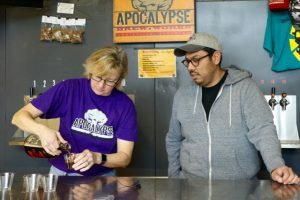 Armando Barajas brewed the Official 2018 Tailspin Ale, Gimme S’More, with Leah Dienes at Apocalypse Brew Works. This traditional Dunkelweizen is flavored with cinnamon and vanilla that gives it a little toasted marshmallow taste. Campfire here we come. 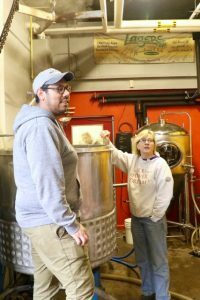 The fifth annual Tailspin Ale Fest will fly into operation February 17 at Bowman Field with 75 breweries, bands, music and happy people. 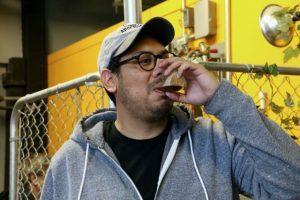 Armando’s Gimme S’more was selected this year from dozens of Lagers Homebrew Club entries, vying for the opportunity to brew on a large commercial system and share their beer at the Tailspin Ale Fest. Armando and Leah try to ignore Bill looking through the rear window. 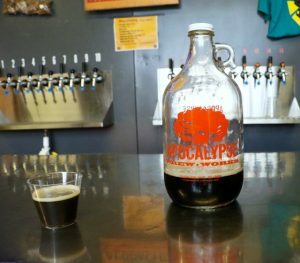 Armando brought a little jug of deliciousness to share at the brew session. Armando demonstrates how to properly drink marshmallows.